A number of GTW women will be representing all of us when they attend events in conjunction with the UN Commission on the Status of Women the second week of March in New York City. Many regions are having their own IWD celebrations, large and small, on or near March 8. Due to the fact that this newsletter is quite long, I am not including detailed information on these regional events. You can see some of these at the Events tab on our website www.gatherthewomen.org as well as on our Facebook page. As of January 1, 2014, our roster of Conveners changed. We bid a bittersweet goodbye to Barbara Belknap of Alaska who has been the Matrix Convener for the past four years. Because of Barb’s unwavering dedication to circles of women, our organization grew by leaps and bounds internationally. Barb will continue to be Regional Coordinator for Alaska, and we look forward to seeing her at the Annual Gatherings. Our featured Regional Coordinator this issue is Marta Martinez Arrelano of Spain. Editor’s Note: Although Marta gave me permission to correct her wording, I choose not to do that. I love the flow of this, and therefore want it to remain as she wrote it. After the English version, Marta also offered us her responses in Spanish. I have included them both for our first bilingual RC intervoew! Marta also sent four pictures, and I love them all, so I couldn’t pick just one. My mother tongue is not English… I have translated from different languages, English amongst them, since 1986, so I have quite a good domain of those languages and I take the liberty of using the words and expressions my way, as I do in Spanish. Some of them are not understandable “at first glimpse”, some of them correspond to the way I feel language, and others are literally incorrect. I am… in search. I am mother, sister, daughter, wife, friend, lover, partner, reader, seeker, finder, speaker, teacher, learner, writer, philosopher, mystic, coach, mentor, journalist… a lively Spirit in a young body almost in its fifties. I was born in Spain, in the bosom of a traditional catholic family, in one of the most traditional regions of the country, Navarra. The family formed by my parents and siblings has always been enlarged in a bigger family bond through strong family ties, woven by women and their domestic power. I also love to weave those ties by organizing meetings and parties that would gather the hundred we are. I have lived a lavish and non-conventional professional career. I have worked most of the time as a freelance and independent professional, collaborating with hundreds of professionals and small to medium enterprises (SMEs) in most continents, as well as with transnational institutions. I accompany entrepreneurs and dreamers in developing their market sustainability models. I have travelled and learned so much about multi-cultural competencies. I am passionate about learning and always search for new tools on personal or professional development. I am definitively different as anybody is. I do have some special gifts such as languages – I speak and understand over five, quick reasoning and enlarged sensibility, I am sinesthetic, I can see and feel the energy we are and surround us. I am empathetic and I can feel and work with the energy emotions liberate. I can see and draw big picture scenarios, helping individuals and enterprises to draw their way up to their goals. I am a natural connector, I connect ideas and people, and I have used this to work on major international projects. Brought up in the certitude that I was “Inconvenient”, not-matching in the paradigm of the “good girl” serving others despite herself, and the models that my society claimed for me, but I managed to pretend. I would say, at a certain point in my life I decided to become invisible, to empty myself of my value unless others would recognise it. About four years ago, my whole paradigm blew up in the air, and I discovered the marvellous joy of my difference, the incredible gifts of my talents, and that my “inconvenience” should be used to change things, to change paradigm in order to leave a more gentle world, a paradigm more focused on happiness, on appreciation of who each of us is, humanize the world we live in, the world of business, of relationships, of self-relationships… and since then, I try to find my “business model” to make it happen. Therefore, some would say I am a social change agent… some would say I am just a dreamer. I burn in the face of social rebuke, greed, misery and ugliness. I specially burn on emotional repression, paradigm compulsory instructions and lack of justice. I can feel the Oneness, and anything against It lights my fire, moving all my creative resources towards the change. I love to accompany people and enterprises to humanize their realities, in the process to allow themselves to be exactly what they are amidst the Oneness. I love to accompany NGOs and social institutions to become really sustainable and efficient to serve those for whom they have been created. I know light is only seen in darkness, it is there where is more needed. But sometimes I feel too alone to continue lighting. So I searched for some company, and I met GTW. As you can imagine, I used to live myself as an “inconvenient” being, out of place, out of tune, making huge efforts in becoming similar to others, trying to fit in the paradigm of work, social roles and other things, and in that path I gave myself as a present amongst a relationship that failed due to my lack of self-esteem, but made me meet my two incredible children and the opportunity of growing, starting anew with a new relationship with a lovely man, and giving birth to a third child. During that journey, I realized that most of my life paleness and mistreat was due to the way I had been brought up as woman: humble, silent, servant, always looking for others opinion and acceptance… And it urged me to change that for my kids, and for others. I do not resonate with the feminism in Europe, I see it as a “machismo in skirt”. I do not want to become equal to men! I love to be woman! We do supply so many different and necessary values that have been ignored during centuries. When I read about the Vision Statement, I thought that was it. When I read about the Millionth Circle, I thought I wanted to be part of it. And here I am. My creative resources ready to get combined with those of others… to reach the change. ¿Quién eres en el mundo? Soy… una buscadora. Soy madre, hermana, hija, esposa, amiga, amante, compañera, lectora, alguien que busca, alguien que encuentra, conferenciante, profesora, aprendiz, escritora, filósofa, mística, coach, mentora, periodista, comunicadora… Un espíritu inquieto en un cuerpo casi en sus cincuenta. Nací en España, en el seno de una familia tradicional católica, en una de las regiones más tradicionales del país, Navarra. La familia formada por mis padres y hermanos siempre se vio ampliada en una familia mayor, unida por fuertes lazos familiares, tejidos por mujeres a través de su poderío doméstico. Yo también adoro tejer esos lazos organizando encuentros y fiestas que nos reúnan al centenar de personas que somos. He desarrollado una carrera profesional abundante y no convencional. He trabajado la mayor parte del tiempo como independiente y free-lance, colaborando con cientos de profesionales y PYMES en casi todos los continentes, así como con instituciones transnacionales. Acompaño emprendedores y soñadores en el desarrollo de sus modelos de sostenibilidad en distintos mercados. He viajado y aprendido mucho sobre competencias transculturales. Practico la formación continua e investigo constantemente nuevas herramientas de desarrollo personal y profesional. Soy definitivamente diferente, como cada Cual. Tengo algunos dones especiales, como el don de lenguas –hablo y entiendo más de cinco-, la rapidez de razonamiento y la sensibilidad ampliada, soy sinestésica, puedo ver y sentir la energía que somos y nos rodea. Soy empática, puedo sentir y trabajar con las emociones y la energía que liberan. Puedo ver y trazar escenarios de amplio marco, ayudar a individuos y empresas a dibujar el camino hacia sus metas. Soy una conectora natural, conecto ideas y personas, y he utilizado todo ello para trabajar en proyectos internacionales. Crecí con la certeza de ser “inconveniente”, de que no encajaba en el paradigma de la buena chica” que sirve a otros a pesar de sí misma, en los modelos que la sociedad demandaba de mí, pero supe amoldarme. Diría que en un momento determinado de mi vida, decidí hacerme invisible, vaciarme del valor intrínseco de mí misma y sólo reconocerlo cuando los demás me lo reconocían. Hace unos cuatro años, todo mi paradigma saltó por los aires, y descubrí la maravillosa ventura de mi diferencia, los increíbles dones de mis talentos, y que mi “inconveniencia” debía ser utilizada para el cambio, para cambiar el paradigma y poder dejar a mis hijos un mundo más amable, un paradigma más enfocado en la felicidad, en la apreciación de quién somos cada uno de nosotros, humanizar el mundo en el que vivimos, el mundo de la empresa, las relaciones y las relaciones con uno mismo… y desde entonces, trabajo en diseñar mi “modelo de negocio” para hacer que las cosas sucedan. Por todo ello, yo diría que soy un agente social de cambio… y otros dirán que soy sólo una soñadora. ¿Qué te hace vibrar, qué cosas te encienden? Soy una mujer bastante “combustible”, me “enciendo” rápido… Soy luz que alumbra y desdibuja los límites de lo permitido. Soy apasionada. Me hace vibrar la vida, la alegría, la felicidad, ayudar a otros, conectar personas e ideas. Ante cualquier situación siempre cuestiono los límites… Y si..? Me enciendo ante la censura social, ante la codicia, la miseria y la fealdad. Me enciendo particularmente ante la represión emocional, las instrucciones y modelos rígidos de nuestra sociedad y su falta de justicia. Puedo sentir la “Unidad” de todo y todos los que estamos, y cualquier cosa que atente contra ella, me enciende, y pone todos mis recursos creativos al servicio del objetivo de cambiarlo. Me encanta acompañar personas y empresas a humanizar sus realidades, a moverse hacia esa “unidad” sostenible, en el proceso de permitirse ser exactamente lo que Son. Me gusta acompañar ONGs e instituciones sociales en su camino de devenir socialmente sostenibles y eficientes para servir a aquellos para quienes fueron creadas. ¿Qué te llevó a Gather the Women? Se que la luz sólo se ve en la oscuridad, es ahí donde es más necesaria. Sin embargo a veces me siento muy cansada y sola de ser luz en medio de un mar de oscuridad y necesitaba compañía. Solía vivirme como un ser “inconveniente” fuera de lugar, fuera de sintonía, haciendo un gran esfuerzo para parecerme a los demás, intentando encajar en el paradigma del trabajo, los papeles sociales y esas cosas, y en ese camino, me regalé en una relación que fracasó debido a mi falta de autoestima, pero que me regaló dos hijos increíbles y la oportunidad de comenzar de nuevo una nueva relación con un hombre maravilloso con el que tuve un tercer hijo. Durante esa travesía, me dí cuenta de que gran parte de la palidez de mi vida y del maltrato se debía a la forma en la que había sido educada como mujer: humilde, silente, servidora… Y me urgió cambiar eso para mis hijos, y para el resto de personas. No me resuena el feminismo al uso en Europa, me parece un “machismo con faldas”. ¡No quiero ser igual a los hombres, adoro ser una mujer! Aportamos cosas diferentes y muy necesarias, que han sido ignoradas durante siglos. Cuando leí la visión de GTW me dije que eso era exactamente lo que tenía que ser: “permitirnos ser quienes somos”. Cuando leí la documentación del círculo millonésimo pensé que quería ser parte de ese movimiento. Y aquí estoy. Mis recursos creativos listos para combinarse con los de las demás para producir el cambio. Gather the Women has the perfect tool for you! 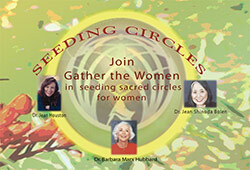 Gather the Women has developed the engaging “Seeding Circles” DVD to help you bring women together to experience listening and sharing in meaningful conversation. All proceeds from our DVD sales go directly toward helping us grow and help more women like you feel connected and empowered. Learn more, purchase a DVD, or find out more about becoming a Regional Coordinator in your area, by contacting Mary Cunningham atMary@gatherthewomen.org. If you are looking to connect with women in your area, you can search Facebook by city to see who comes up and who they are affiliated with. Go to this link:http://www.facebook.com/find-friends/browser. Type in your city of choice and see who comes up. Great way to meet new friends and to see who is doing what in your area. To find a circle gathering near you, make sure to visit our FACEBOOK GROUP where they are being posted by women just like YOU. And, as always, if you can’t find one near you, we encourage you to create one yourself! We have a special resource available to you to help you do just that! Gather the Women Global Matrix is a 501c3 corporation.